Whether you are a serious aficionado of the sport or you’re just looking for a fun backyard game to play with family, croquet is a wonderful pastime, one that can be played and enjoyed by one and all. If you are currently in the market for a croquet set, the following article may just be able to help. 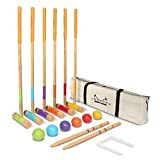 Here we have reviewed several of the most popular and best-selling croquet sets available, and highlighted some of the pros and cons associated with each product. We have also included a Croquet Set Buying Guide, in which we will explain all the factors and characteristics to look for when purchasing one of these fun sets. Made by a company renowned for family-friendly sports equipment, the Baden Deluxe Series Croquet Set is the perfect solution for a lazy summer afternoon. Complete with all the pieces you need to play, including mallets, balls, stakes, wickets and more, the game is ready to use right out of the box. 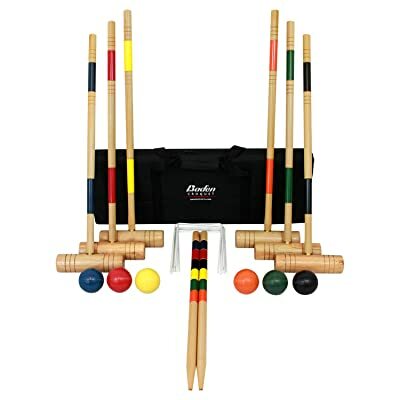 The detachable mallet heads make this set one of the most portable on our list, as well as being one of the most budget-friendly croquet sets in the marketplace. Easy setup. Containing everything you need to start a fun game, the Baden Deluxe Series Croquet Set is easy to setup and play. Budget-friendly. This is the perfect croquet set for families who are watching their budget. Portable. With detachable mallet heads and an included carrying bag, the Baden Deluxe Series Croquet Set is very portable. Durability issues. Some reviewers have lamented that the set did not last very long before certain pieces started to break. Not designed for experienced players. The Baden Deluxe Series Croquet Set is not the set for the serious croquet player. 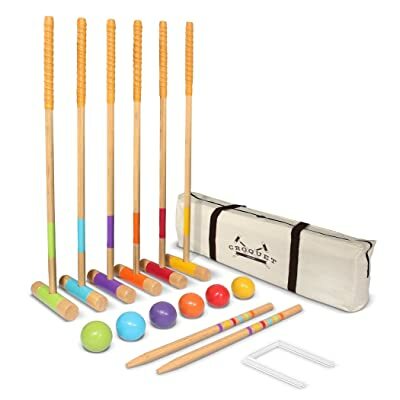 The GoSports Premium Croquet Set is a fun game that the entire family will enjoy. 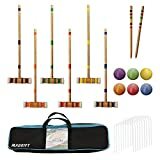 The six-player set comes with six color-coded wooden mallets; 5 matching balls in green, blue, purple, orange, red and yellow; two center stakes; 9 wickets and a handy carrying bag made of tough canvas for easy portability and storage. There is even a handy rule book that explains the game and its rules of play. Measuring 35 inches long, the mallets in the GoSports Premium Croquet Set are the perfect size for both adults and children. The traditional wooden mallets offer a standard hitting surface and the heads can be disassembled from the shaft for easy storing. Best of all, buyers of this set receive a 100 percent money back guarantee if they are not completely satisfied. Genuine wood. Unlike some of the more cheaply-made sets, the mallets in the GoSports Premium Croquet Set are completely made of high-quality wood. Perfect size. Not too tall for kids and not too short for adults, the croquet mallets in this set are perfectly sized. Rule book. The colorful rule book in the GoSports Premium Croquet Set is a nice bonus. Smaller heads. The surface area on the heads of the mallets is a little smaller than that of other sets. Mallet heads come unscrewed during play. Several reviewers complained about the mallet heads in this set coming loose during play. Those serious about croquet will fall in love with the Wood Mallets Premium Garden Croquet Set. Impressive from the start, the set is packaged in a finely crafted finger-jointed pine storage box with rope handles for easy portability. 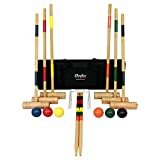 The four player set comes with everything you need to play the game in style, including a set of four colorful regulation-sized (16 ounces) composite balls; four quality-crafted mallets with octagonal hardwood shafts and cylindrical heads; hand-tooled and powder-coated wickets, center stakes, corner pegs and metal clips; and a brilliant 28-page book outlining the rules and tactics of croquet. Elegant and comprehensive. Everything about the Wood Mallets Premium Garden Croquet Set is elegant, from the wickets to the hand-crafted pine carrying box. Regulation balls. The balls in this set are made of quality composite and each weighs in at the regulation-size of 16 ounces. Rugged wickets and stakes. The wickets and the stakes in this set are constructed to take a beating. Premium priced. The Wood Mallets Premium Garden Croquet Set is a little on the pricey side for a four player set. No boundary string. The set does not come with string to mark the boundaries of the playing field. Croquet is a wonderful game. However, before you go out and buy the very first croquet set you see, you may want to take a minute to read this helpful buying guide. Here we have highlighted and explained some of the things to look for when shopping for a croquet set—tips that will help you pick out the perfect set for your family. Naturally, one of the most crucial steps to finding the perfect croquet set is to determine the ages of the players who will be primarily using the set. There are many sets geared specifically for children, with smaller balls and mallets. There are even some budget-friendly sets made for very small children, in which the balls and mallets are made of plastic or hard foam. This helps to mitigate injuries and ensures the balls and mallets are of a manageable size. The majority of people buy croquet sets for the whole family. In cases like these, a quality lawn croquet set is usually your best bet. Lawn croquet sets typically feature lightweight wooden mallets, hoops and balls, guaranteeing that every member of the family can enjoy the croquet set equally. A lawn croquet set is also a good choice for beginners, regardless of age. 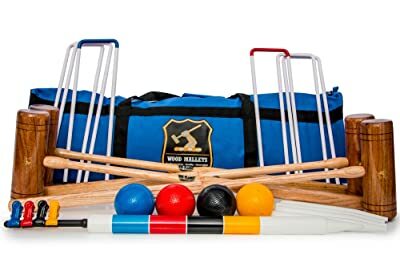 A lawn croquet set is a good way to practice your aim and precision before moving up to one of the more deluxe sets, which feature weighted balls that are more difficult to maneuver. Those that are more experienced in the game of croquet may be ready to graduate to some of the more professional croquet sets. These sets generally have mallets that weigh 1.3 kg and the various croquet balls weigh in at 16 ounces (1 pound). Moreover, the mallets in these sets are of the very highest quality and finely structured. This type of advanced set will ensure the highest degree of accuracy when rolling the ball, and just one or two games usually make players of this game hooked for life. A mallet is the club used to hit and roll the ball in croquet—a stick that features a rounded head/hitting surface on both sides of the club. There are many theories as to why mallets were originally designed with a head on each side of the club. Some say it is was designed that way to give the club balance, while others say it was to allow left-handed and right-handed players to use the same clubs. Either way, depending on the exact type and purpose of the croquet set, you can generally expect the number of mallets in a given set to vary—usually between 4 and eight. Also, the head of the mallet is essentially screwed onto the bottom of the stick, and during the game you may have problems with the head becoming unscrewed—but reattaching it is easy. Mallet heads are screwed on—rather than glued or nailed—to allow for more compact storage of the set. Mallets in a croquet set range from about 3 feet to 3 1/2 feet in length. At this height, most children can use the mallet as they stand tall, while taller adults will probably need to bend over to certain degrees when playing the game. Mallets in different croquet sets can vary in weight, but professional mallets usually weigh in at about 2 pounds, or 1.3kg. Professional mallets in croquet sets are almost always made of some type of wood, such as hickory, ash, or tawa wood. Recreational sets can be made of wood or a variety of other materials, including aluminum, fiberglass and carbon fiber. These other materials are usually lighter than wood, but ironically, most experts suggest that very young players and beginners use the heavier wooden mallets because it will help them get more power and ball-rollout out from their hits. Shape of the shaft. The part of the mallet you hold is called the shaft. Shafts can be rounded, hexagonal, or even octagonal. Most opt for a shape other than round, because it makes it easier to hold the club. Shaft rigidity. Advanced croquet sets will usually have very rigid shafts. This is important as it helps reduce any unnecessary play in your swing. Peripheral weighting. Many professionally styled croquet mallets will have peripheral weighting on the sides of the head that will help you swing in a straighter path. Size of the head. More experienced players may prefer a mallet with a smaller hitting surface as it challenges their precision. Beginners should use a mallet with a larger head to avoid hits that catch the edge of the club. The most important thing to look for when buying a croquet set is the color of the balls. 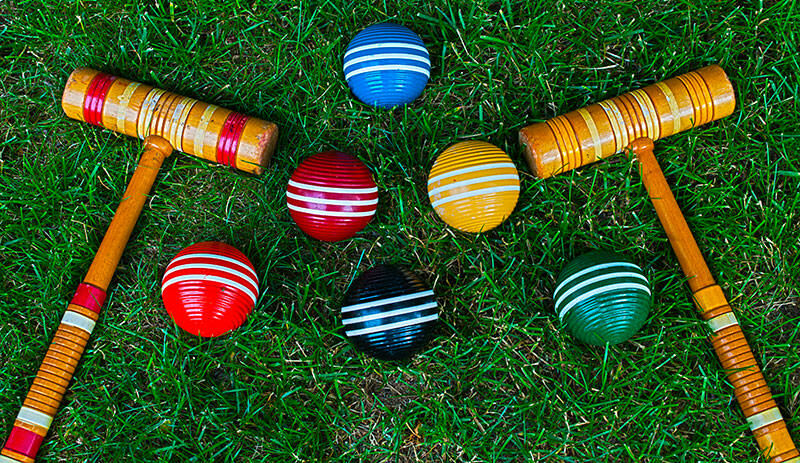 Typically, croquet balls come in a variety of colors, such as orange, yellow, black, red, blue and even purple. The colors are important because they match the color of the clubs. For instance, if player one selects the red mallet, he or she will also play with the red ball throughout the game. This helps to avoid confusion during the game and disputes over whose ball is whose. As we mentioned briefly above, the regulation weight of the croquet ball is 16 ounces. In tournament play, everybody must play a regulation ball, to ensure nobody gets an unfair advantage. However, when playing with family you can mix and match balls of different weights, even allowing the younger children to play with a plastic ball if need be. The stakes in a croquet set are the actual target you will be aiming for as you play. These normally have the colors of the balls on them, which indicates that you are to aim at and hit them with the ball. Over time, these stakes can take quite a beating, so be sure to look for a croquet set whose stakes are very sturdy and durable. Wickets are tunnel like pieces on a croquet set that will be set up all over the yard in which you are playing the game. Out of all the pieces in your croquet set, you will have more wickets than any other components. The goal of croquet is to pass your ball through these wickets in a prescribed direction, and the one who completes this goal first wins the game. Like the stakes, be sure to look for wickets that can take a beating over time. These pieces will most likely be hit by balls and mallets several times throughout the game, so if you don’t want deformed wickets that are difficult to pass through, make sure you think “durable” when checking out these components. Lastly, croquet sets can be very basic in nature, including a minimal amount of mallets, balls, stakes and wickets; or very elaborate and comprehensive, with all of the above-mentioned components plus items like colorful corner pegs and boundary string to vividly mark off the playing field; and wicket clips that make it easier to see the wickets from a distance.